FINDING A MOM-LIFE BALANCE. LEARNING YOU CAN TAKE CARE OF OTHERS ALL WHILE TAKING CARE OF YOURSELF. I recently watched Chasing Coral with Richard Vevars. The film gives you so much amazing information about a world that sustains OUR world. Coral Reef Ecosystems provide food and a source of income for over 500 million people. The ocean is a life source for us, but for most of the population it is also out of sight out of mind. We have lost 80-90% of coral in Florida, and in the last 30 years we have lost 30% of the world’s corals. Richard’s “coral google maps” pictures featured in the documentary are startling. The enormity of the issue is depicted JUST with his photos. The documentary scientists drive it home with truly explaining that these corals, fish, SHRIMP, etc. all participate in the community, the underwater city, that affect and serve millions of people. Right down to the beaches we love! Fun fact from the documentary: parrot fish eat and then “poo” out sand….so any beach you walk on basically came out of a parrot fish! Also, many of our drugs, some of which fight cancer, come from our coral reefs. The coral reefs are the buildings of the ocean…and you can’t have a city (fish) without coral. I could literally go on and on about the facts I learned from the film, but you should in all honesty watch and learn as well! One final point that the film wanted to make very clear: imagine if your body rose just one degree and continued on and on…you would die. This is what the researchers say climate change and global warming are doing to our coral reef ecosystems. A raise in water temperature (just 2 degrees Celsius) is causing these reef to turn white, and eventually die. I have such a massive respect for the scientists that dedicate themselves to helping us better understand our environments! I also want to do my part. I used Kait’s guide, and research on my own before our trip to Saint Thomas this winter. I have used both these following brands on myself and my daughter, and they stand up as my favorites! 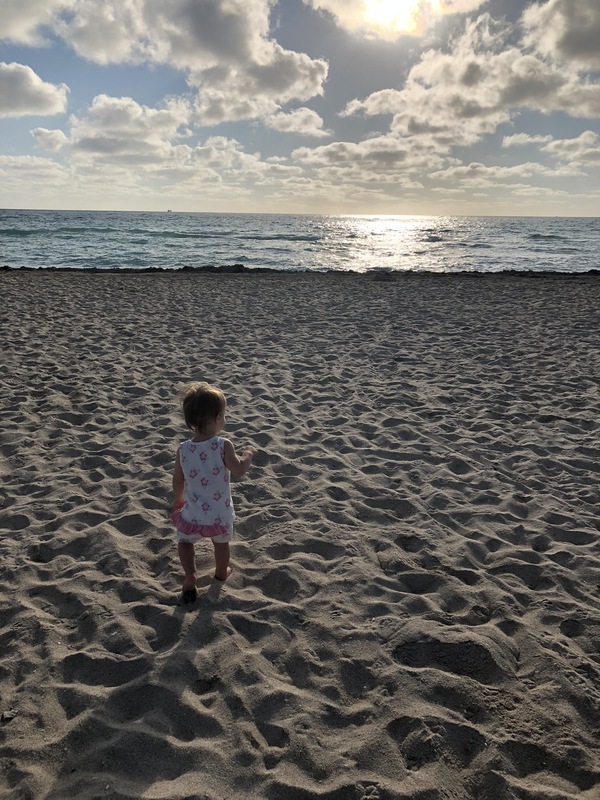 Baby Badger Sunscreen: I loved this sunscreen for my one year old. They sell Baby Badger in both stick and lotion form. This stuff goes on THICK. I mean like peanut butter, and it WORKS! You could see where you needed to reapply, but it stayed on both in the pool and ocean. I used Badger Sunscreen on my body when we were snorkeling or paddle boarding (paired with a sun shirt), but my only negative for me was it was SO thick! So, if I were just enjoying a cold one on the beach, or using lotion on my face I used BeautyCounter Counter Sun. It smells great and rubs in really easily! Not to mention I use their products on my face anyway (I have sensitive skin) and they didn’t bother me at all, which is huge for me! While we all might not be able to travel our children physically around the world we can prevent OUT OF SIGHT OUT OF MIND and here are some ways! Visit aquariums and start discussions! Talk to your kids about how coral reefs ARE living things! Not only that, but living things that keep all our beautiful fish, turtles, seals, dolphins, etc. alive! They are the buildings that make up the city. Teach children to LOVE science! Science should be respected, as well as scientists. Have them do in home experiments, google scientific studies of the oceans, research animals and habitats, and what endangers and protects our ecosystems and planets. Teach children how to be environmentally conscious! Lead by example. Use reef safe sunscreen and tell them why, choose to make less waste, research products with them that are more friendly to our environment, teach them it is not ok to litter…at all! We can all make a difference, and so can they! Teach children to advocate for the environment! Get out there and volunteer! Teach them how to politely decline a bag at a store, gather classroom recyclables, use less plastic, paper, etc. Previous Will You Be My Listening Partner? I am a Full Time Mom and Part Time Speech and Language Pathologist. Becoming a Mom has brought me to to numerous new life lessons, including balancing self-care with caring for my family, fulfilling my professional goals in new ways, and striving to raise good humans! This page is a space to share my own experiences, successes, and failures, hopefully create a positive space for others to join, and invite you to join me in pursuing happiness in whatever life journey you are on. Our children are our greatest teachers, and looking for us to teach them in return.